Another question of Most Googled Questions Of 2016. Good that I used to live there. So now you get first-hand recommendations on what to do! I never realised how much you can do in this 7×7 area of San Francisco… Since this will be a long one, feel free to jump what you like most! This could will become a very long one… bare with me! It’s worth it – pinky promise! Walk across it. Cycle across it. Drive across it. Whatever you do – cross it. And take pictures while doing it and also before/and after the crossing. Here are the top 5 spots to take pictures of the bridge! It’s very iconic and we’ll get to it later in the food section! This is one of the places you either love or hate. But to decide you definitely have to see it at least once. Many people will recognise it from movies. I recommend to book tickets in advance, as especially the “night tours” tend to sell out in advance. You just have to see it when visiting San Francisco. It is so iconic and fun to drive down. Yes, you can drive in one direction only! The view from up there is fantastic. If you want to get the complete historical experience, then the cable cars are a must do. But keep in mind that they are quite pricey and most of the times really packed. One ride is 7$ – so definitely see it as an attraction and not an actual form of transport. This place is just beautiful. Not only the buildings are impressive by themselves. They also happen to be located right at a little pond where you can also find some swans peacefully swimming around. A very serene place with history. A beautiful place, especially breathtaking on a sunny day! It’s also surrounded by great hiking trails. There is also a cave to explore with the ocean rushing in and out. Go watch the sea lions! But hold your nose closed! As much as it’s nicer to visit them on a sunny day, that’s when most of them turn up to sunbath, it’s also the day they smell the most. Other than that, there are lots of food places with nice views. Close by is also the Aquarium and lots of souvenir shops, of course. I’ll call it hidden places, because they’re not the main things to do in San Francisco and also not that easy to find. Though you might stumble across some of the decorated staircases by accident! 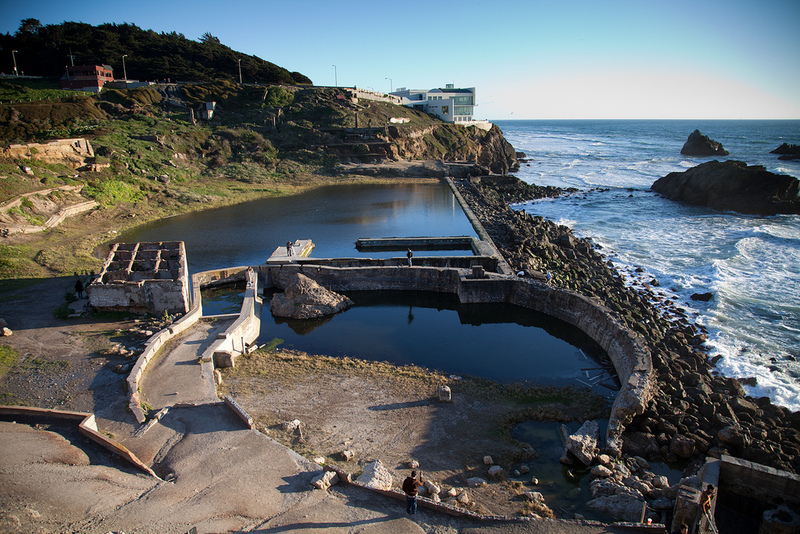 It’s not too far away from the earlier mentioned Sutro Baths and could be easily combined with it. What I actually did. It was a great day full of amazing views! There are so many beautiful trails around this place! The place itself is like a “labyrinth” of stones and offers you a great, though distant, view of the bay and the Golden Gate Bridge. YES! Climbing staircases is actually a fun(ish) thing to do in San Francisco! There are so many of them because of all the hills. So they decided to decorate a lot of them beautifully! You’ll find tiled ones for example. My favourite one: the Filbert Steps starting at the Coit Tower! Like a mini jungle with view over the totally underrated Bay Bridge. This park is massive and has so much to offer, that it actually needs an own post dedicated to it. Some highlights are definitely the Conservatory, the Japanese Tea Garden and lakes. Check out the handy map I linked for you! You’ll get iconic views of both, the Golden Gate and the Bay Bridge! It’s sprinkled with picnic tables, beaches and marsh overlooks. Make sure you pick a sunny day. The perfect starting or end point for exploring Mission District. It has San Francisco’s best street murals like the Clarion Alley Mural! Not really a park for kids, though. A lot of young people enjoying a few drinks and also smoking. San Francisco has so many beautiful views, the previously mentioned Land’s End Labyrinth could also easily make a spot on the lookouts section to be honest. It does not only give you beautiful views over the Golden Gate Bridge, but also the Bay Bridge – which is much more interesting at night, than the Golden Gate Bridge! While the Coit Tower itself is not that spectacular during the day. It is definitely worth day visit at night, it gets lit up in different colours every night! While the entry to the tower is free, taking the elevator up will cost you. We recommend to visit their website and prebook to skip the queues! Definitely worth the 360° view! San Francisco is an awesome place to have great food. It’s expensive, but definitely healthy. Whatever new trend is going on, it probably started in San Francisco. Like all the avocado thing that is going around at the moment. Go explore the marketplace together with the locals on Tuesdays, Thursdays, and Saturdays. The stalls offer a huge range of produces from 75 regional farmers until 2pm. Chocolate, cheese, fruits… name it – you get it. PLUS: It’s also one of San Francisco’s famous sights. It’s all about coffee and delicious pastries – the old fashioned way. We recommend going for a Banana Cream Tart or a hot pressed sandwich. Since they’re so popular, you should get there right before they open at 7:30am to avoid the crowds. The queue moves quite fast though. Still – who got time to stand in line? Be prepared to queue. But they do have the best pizza in town. You can leave them your number, grab a beer somewhere else and pick up your pizza when called, though! If you want it a bit faster, you can order at their “Slice House” for take away. Where the best ice cream place is probably a never ending debate. Here a two great places. Smitten Ice Cream makes its ice cream with liquid nitrogen which will give you an extra velvety texture! They have multiple locations all over San Francisco. Go check out their website to find the nearest to you! Bi-Rite Creamery is amazing. The I like it is that they have some really unique flavours! You can try Earl Grey, Honey Lavender or Ricanelas. Of course they also have some classics and if you’re feeling curious but not overly adventurous, go for their Salted Caramel. Always a good decision. There are just so many delicious food places, I probably could will dedicate a whole post just to “Where to eat in San Francisco”. Stay tuned!